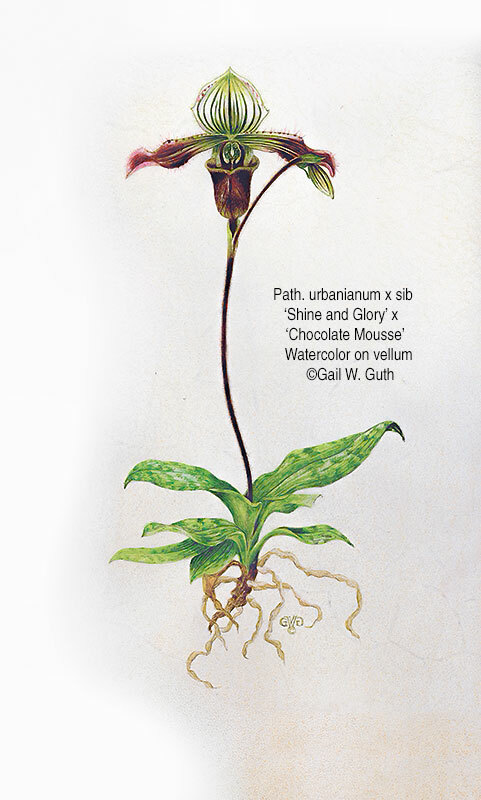 It was a rare treat to spend four days with botanical artist Carol Woodin during the 2013 Education Workshop, “Painting Slipper Orchids in Watercolor” May 31st - June 3rd at the beautiful Reiman Gardens in Ames, Iowa. Carol is a wonderful botanical artist whose breathtakingly beautiful artwork has been exhibited and collected around the world. She has exhibited at the Royal Botanical Gardens at Kew and the Smithsonian in Washington, DC, and has her artwork in the Shirley Sherwood collection. We had class participants come from Minnesota, Illinois, Michigan, Kansas, Iowa, Colorado, and Vancouver, British Columbia. One participant, Matthew Constant, is a very talented high school student who is looking into scientific illustra­tion as a possible career. This was Matthew’s first time working with vellum and his first time seriously working with watercolor paint. He has a lot of potentials. To prepare for this workshop, we cultivated native yellow lady-slipper orchids Cypripedium parviflorum and Cy­pripedium pubescens, which we acquired from Raising Rarities in Ohio (www.raisingrarities.com). 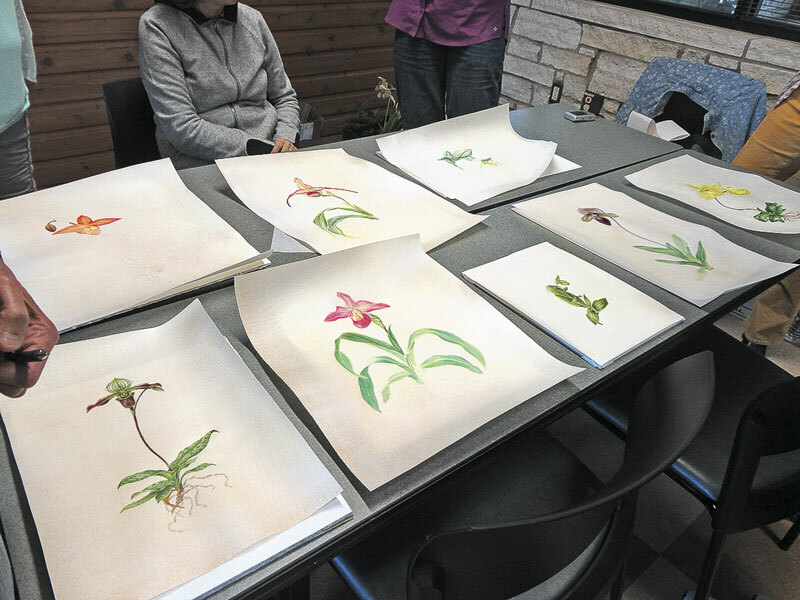 Unfor­tunately due to the extremely wet and cooler-than-normal weather in Iowa this spring, only three of the plants bloomed in time for the workshop. 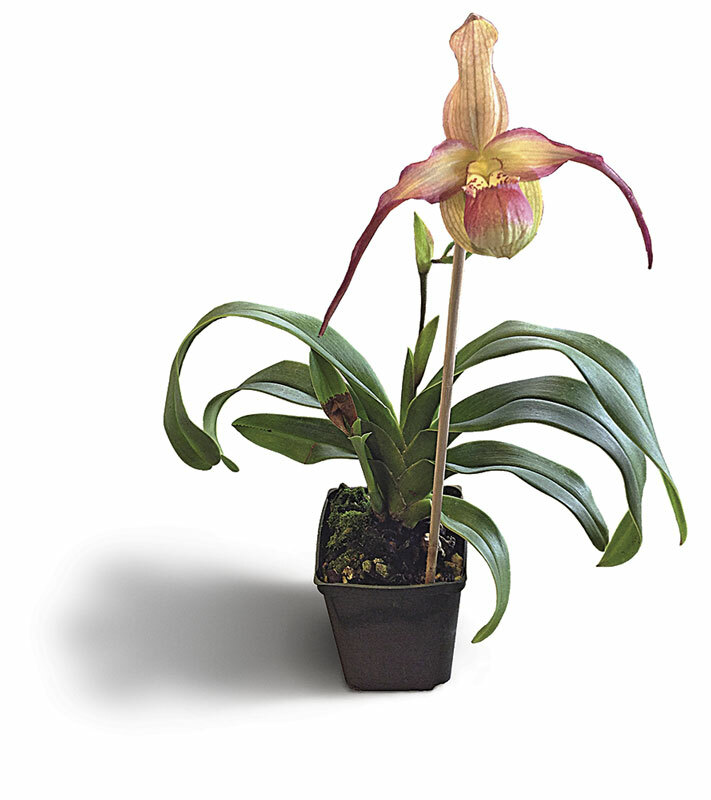 As a backup, we borrowed some beautiful exotic slipper orchids from Bird’s Botanicals in Kansas City, Missouri (www.birdsbotanicals.com). Sara Taliaferro and Carol vis­ited “The Cave” at Bird’s Botanicals and picked out some stunning specimens for us. Not all of those gorgeous and exotic slipper orchids made it back to Kansas City though, because some of us just felt it necessary to buy the orchid to finish our painting at home in our studios. I, for one, am guilty of that. 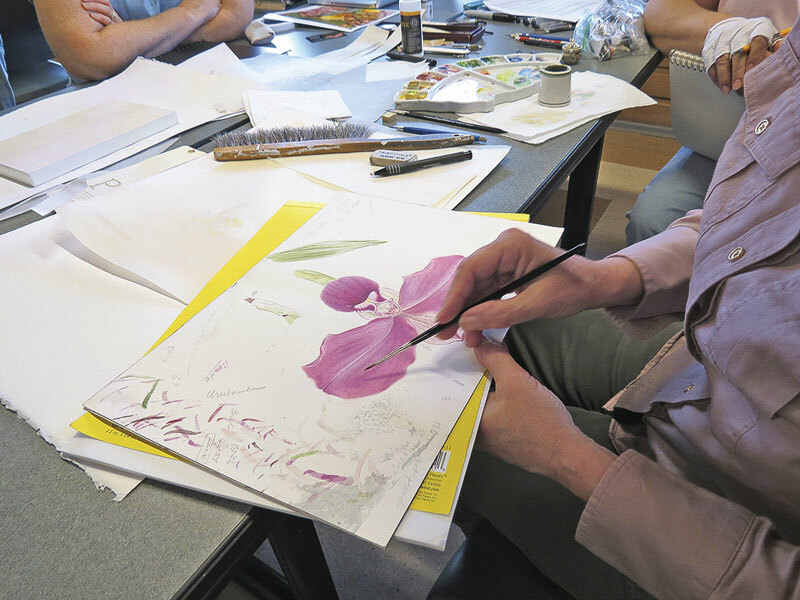 On Day 1 of the workshop, Carol gave us an introduction to slipper orchids, the floral structure of the bloom, composition of traditional and contemporary botanical artwork, and an introduction and his­tory on vellum and its properties. Mark Leoschke, a native orchid specialist from the Iowa Department of Natural Resources, gave a wonderful slide presentation about the different native orchids found in the state and discussed how hard it is to find them due to declining natural habitat (increased demand for more farmland and residential areas, recent droughts, recent floods, etc). We then went on a field sketch session at the nearby Doolittle Prairie north of Ames. Getting there was an adventure because the main road leading to the prairie was closed due to flooding. Af­ter seeing several cows and going the round-about way, we arrived at the prairie — but unfortunately did not find any orchids. When we arrived back at the classroom, we chose our orchids and started our sketches. Then Carol gave a wonderful talk on her artwork, her travels and her path to painting slipper orchids. On Day 2, we worked on our compositions while Carol discussed more the plant structure and working with vellum. We prepared our pieces of vellum and transferred our sketches. All of the participants worked on natural calf vellum from Pergamena (www.pergamena.net) in Montgomery, New York. We had three large skins brought in to divide up so participants could choose a piece depending on the natural color and veining. Then it was time to actually do some test painting on a small scrap of vellum so we could get a feel for the material. It is amazing how the paint lays on the surface; it does not soak in very much, so you need to work with a dry-brush technique — and then one drop of water can wipe it all away. That is a ter­rifying thought for any artist: what if I sneeze? As we finished working on our sample piece and some of us moved on to start the actual large piece, you could feel a bit of tension in the air. It seemed like everyone was holding their breath when they started and then let out a big sigh when they made the first few tentative strokes. We also learned that sometimes the slipper orchid blooms fall off the stem unexpectedly: while Carol was teaching us how to stretch vellum on a board, that is what happened to my bloom. I am so glad I took a lot of photos earlier in the day and had all of my final sketching done. [Editor’s Note: The focused silence of the classroom was shattered by a loud cry of “Oh no!! !” I thought perhaps Patty had spilled her coffee onto her painting!] On Day 3, we continued to work on our paintings. Carol taught us about mixing greens to paint realistic leaves, and how to make the plant look more realistic as a whole with highlights and shadows. By the end of the day, we were all breathing a little easier as our paintings started coming together. On Day 4, Carol discussed painting in transparent layers and how to keep layering paint and using tiny amounts of gum arabic to get the rich, vibrant color that was needed to depict the flower accurately. This stage was tricky because when you start putting too many layers of paint on vellum, the paint starts to lift off onto the brush. Carol taught us some tricks on how to prevent and repair that lifting, which helped our final efforts considerably. We took some time at the end of the day to take a look at everyone’s painting; it was amazing how beautiful the artwork was that we created in just a few short days. Hopefully, when we all finish our pieces, we can display them together in a future show or have them in an upcoming GNSI newsletter to share with you. We had a lot of severe weather and extreme flooding throughout Iowa and the Midwest in the days lead­ing up to this workshop, so I am thankful that everyone made it to the workshop safely. It was wonderful to work alongside such talented artists. I would like to say thank you to Sara Taliaferro for all of her help and patience with this workshop and a special thank you to Carol Woodin for teaching us something truly amazing.